I have found over the years that my path of questions in any interview I conduct, including for Board candidates, follows the same pattern that truly leads us both on an interesting journey, aptly called my 'Career Trifecta.' The journey first starts with understanding the candidate's level of Skill (know-how), which for me equates to their level of knowledge and the theory application of that knowledge. I truly want to get a feeling of how the candidate thinks, some of it hopefully aligning to common industry practices, some of it hopefully bringing to the table a new or interesting approach to explore. Thought leadership is important. As valuable as Skill can be, it of course only tells a portion of the story. I then move to questions that put a spotlight on how those Skills have been applied - which illuminates their Expertise (experience). I want to get a feeling for their ability to do something well, see how they have applied their Skill and made a difference through their experiences. Remember that there are plenty of people with high Skill and not a lot of Expertise, which from a Board candidate standpoint can be debilitating. And the last area to close my loop of understanding is the candidate's Certifications, or proof, of their Skill and Expertise. A visual from my 2017 National Speaking Tour showing the simple, yet succinct, Career Trifecta is above. The topic of Certification (proof) in the Board space typically elicits a scrunched-up face that either questions the comment or is not in agreement. I understand this reaction, but I have a reason for making my statement - and it is a main differentiator when it comes to candidates in all levels of their career, especially in the Board space. Old-school Board thinking is that Expertise (experience) sits at the top of the mountain when it comes to Board Member usefulness and effectiveness. 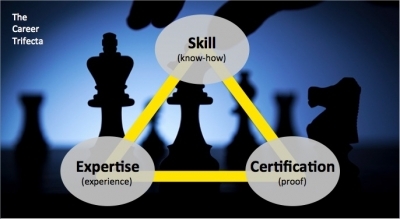 Yes, Expertise is very important, but again, I view it as equally important across all three areas of the Career Trifecta. A Certification (proof) is not just a way of understanding someone's formal knowledge as it applies to an industry and vertical, but possibly more importantly a way to size-up the dedication and drive that candidate has to their particular discipline. A serious Board member wants as many chances as possible to show that Board Directorship is their career, their passion, their discipline. Not a part-time, fleeting experiment to see how it goes (by the way, "seeing how it goes" = damage to your company). A certification shows me that effort and thought was put into themselves and their career. They take it seriously. They want to make a positive impact. Examples of Board Director certifications can be seen through The American College of Corporate Directors (ACCD) and The National Association of Corporate Directors (NACD). I have also found certification courses such as Harvard Business School's Executive Education Program 'Making Corporate Boards More Effective' to be quite enlightening and useful.